What are the different types of damage that cause lameness? These are mainly fractures: although usually caused by trauma, they can also result from the bone becoming fragile due to overwork. Exostosis, sore-shins and bone deformations generally appear in areas subjected to stress. Many bone lesions that cause lameness do, however, occur in a joint. Joint damage is very common in horses. hard tissue damage, i.e. of the bones, which defines the bone elements of the damage. 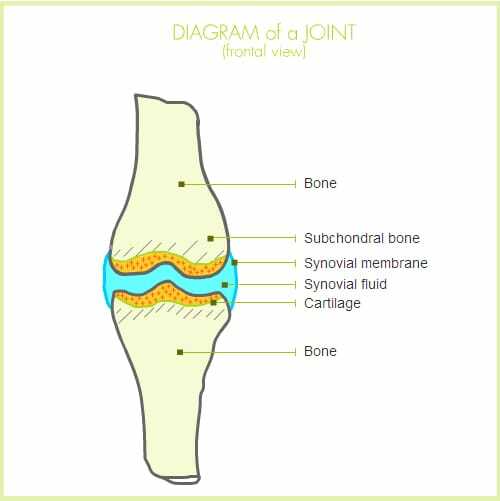 The joint capsuleFibrous structure around a joint, which connects the bones that make up the joint and contains the synovia or joint fluid. and the joint ligaments supporting the joint may be subject to forced movements, strains, tearing (particularly sprains), or remodellingChange in the shape of the bone as compared with its normal shape: the contours of the bone are changed in an X-ray. associated with a chronic process (osteoarthritisChronic inflammation with a degenerative process in a joint.). SynoviaSynovial fluid, fluid contained in the joint capsule of a joint, or in the synovial membrane surrounding a tendon., the joint fluid produced by the synovial membrane, can involve inflammation (arthritisAcute inflammation of a joint. in the acute phase, osteoarthritisChronic inflammation with a degenerative process in a joint. in the chronic phase) or infection, which is very serious in all cases: septic arthritisAcute inflammation of a joint.. The cartilageFibrous, elastic tissue covering the bone surfaces in a joint. It has a sliding and impact-absorbing function., which covers the bone surfaces of a joint, may be cracked and then deteriorate as a result of mechanical stresses, or during inflammatory or degenerativeCaused by wear, and associated with activity, work or ageing. processes (such as osteoarthritisChronic inflammation with a degenerative process in a joint.). The final stage of cartilageFibrous, elastic tissue covering the bone surfaces in a joint. It has a sliding and impact-absorbing function. degradation is when the bone is left bare. 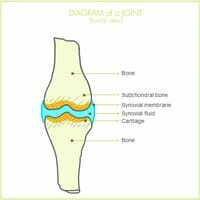 The subchondral boneBony area situated just under the joint cartilage is the bony area just under the cartilageFibrous, elastic tissue covering the bone surfaces in a joint. It has a sliding and impact-absorbing function.. It is an area in which painful remodellingChange in the shape of the bone as compared with its normal shape: the contours of the bone are changed in an X-ray. (sclerosisIncreased bone density: the area is whiter in an X-ray. or demineralisation) is common, associated in particular with mechanical stresses or degenerativeCaused by wear, and associated with activity, work or ageing. type processes (osteoarthritisChronic inflammation with a degenerative process in a joint.). Entheses, sites at which ligaments are attached to the bone, are sensitive to repeated stretching or traction movements: subject to remodellingChange in the shape of the bone as compared with its normal shape: the contours of the bone are changed in an X-ray., with the formation of entesophytes (bone proliferation or ossification of the ligamentFibrous structure connecting two bones. where it attaches to the bone). OsteophytesBony proliferations around a joint. are associated with the remodellingChange in the shape of the bone as compared with its normal shape: the contours of the bone are changed in an X-ray. of the bone, and are small proliferations at the edges of the joint. This includes tendonitis, a common disorder in racehorses, ruptured tendons or damaged ligaments (desmitisInflammation of a ligament, equivalent to tendonitis for a tendon.). The diagnosis of tendonFibrous structure connecting a muscle and a bone. and ligamentFibrous structure connecting two bones. damage has progressed enormously thanks to the widespread use of ultrasonography. When the damage is at the point at which the tendonFibrous structure connecting a muscle and a bone. or ligamentFibrous structure connecting two bones. attaches to the bone, the bony tissue will also be damaged (remodellingChange in the shape of the bone as compared with its normal shape: the contours of the bone are changed in an X-ray., in particular): tendonFibrous structure connecting a muscle and a bone. or ligamentFibrous structure connecting two bones. lesions may thus also have a bony element. This involves in particular myositis (overworking of a muscle that has not been properly warmed up), myopathy or torn muscles. Inflammation and an increase in the sensitivity of the nerves can affect the nerve branches leaving the spinal column. An example of serious vascular damage is verminous aneurysm, which involves the narrowing of the iliac artery, which feeds the hind leg, due to encystment of worm larvae in the wall of the blood vessel. These include wounds, which are very common on a horse's legs, together with skin infections (small infected wound, "mud fever"…) or conditions caused by an allergy. Finally, lymphangitis refers to inflammation or infection of the lymph system in a leg, with severe oedema (swelling), in which the infection has generally entered the body via the skin. These involve sand cracks (breaking of the wall of the hoof), corns (contusion of the sole), abscesses in the foot (infection caused by bacteria entering via a crack in the hoof), for example.